CHENNAI: Prime Minister Narendra Modi on Tuesday evening said currency notes of Rs 500 and Rs 1,000 denominations would cease to be legal tender from midnight. In his rare late-evening address to the nation, the prime minister asked common people to contribute to his government’s efforts to curb corruption, unaccounted or black money, and terrorism that relies on such money, as also decimate those from across the border who were pushing counterfeit Indian currency into India. “The old Rs 500 and Rs 1,000 denomination currency notes would be nothing more than scraps of paper,” the PM said. Here is a look at how it will affect various sectors in the economy in the near future. The jewellery industry welcomed the government’s decision saying gold demand will rise as people will have more faith in the precious metal than the currency notes. “It will create havoc for a little while and the economy will also destablise. But overall, it is going to be good for the country. In fact, the jewellery industry will thrive as people will have more trust on jewellery than currency notes,” Gitanjali Gems Chairman and Managing Director Mehul Choksi said. Unorganised builders and secondary (resale) property market would be adversely impacted following the government’s decision, according to real estate developers and consultants. Housing prices could witness downward pressure, helping revive demand in the sluggish housing segment, they added. “We are moving toward the cashless economy which is a sign of maturing economy. It’s a step in the right direction,” DLF CEO Rajeev Talwar said. “The blackmoney was mostly in land purchase. But in last 6-7 years, there has been no major land buying in this sector. Big builders and organised players are already using bank channel and they would gain from this decision. Unorganised players and the secondary market would be impacted,” he said. India has a little over 10 lakh bank branches. There are 6.8 lakh villages, most of them without a bank. Demonetisation will be a huge shock for bankless villages, which conduct only currency transactions. Since the 500 rupee note is no more legal tender, and rich landlords and rural politicians have to rush to banks in the city, village economies will be hit in the immediate term. Stock markets will remain open Wednesday and all risk management systems and surveillance measures have been beefed up to tackle any extreme volatility in the wake of demonetisation of certain currency notes and the US presidential election results. Banks will remain closed tomorrow for the public to allow them time to cope with the government’s decision to discontinue existing Rs 500 and Rs 1,000 currency notes with effect from midnight tonight. However, the stock markets will remain open, and clearing and settlement systems will operate normally, exchange official said. Marketmen said that the stocks from the real estate and jewellery sectors may be affected. The common man in Mumbai is happy with Prime Minister Narendra Modi’s decision to abolish D1,000 and D500 currency notes from circulation. ‘Oh Teri’, ‘Lai Zyak’ (Marathi equivalent of That’s gr8), ‘Waw!’ were some of the exclamations that were heard on a local train from Mumbai’s Chatrapati Shivaji Terminus. Some welcomed the prospect of putting an end to the black money menace, others showered praise on Modi for being able to keep such an important decision absolutely secret till the announcement. Yet others who argued the decision would be harsh on traders, while some were worried of having to get these notes exchanged. 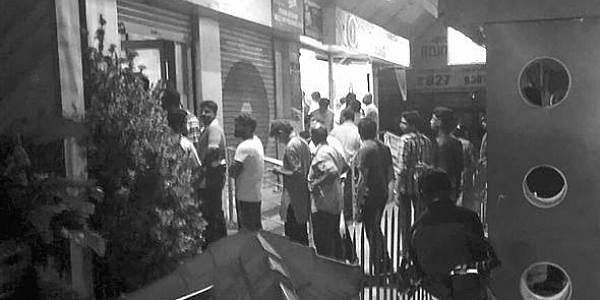 Following the PM’s announcement, Kolkatans rushed to ATMs to deposit whatever amount they had in the D500 and D1,000 denominations and withdraw minimum D400. “My salary came recently and I had some amount in cash. So I rushed to the ATM to deposit it,” said Jharna Das at an ATM in Gariahat in Kolkata. “Those having SBI account can deposit their amount. What would people who do not have SBI account do?” questioned Rajesh Talukdar at an ATM in Jadavpur. Besides long queues at ATMs, liquor shops and bars also witnessed rush, with tipplers crowding to gulp down a few pegs before the clock struck 12. It was chaos in the Uttar Pradesh capital and many other parts of the State as thousands queued up outside petrol pumps, shops, malls and ATMs, to deposit higher denominations and withdraw lower ones. The police were on alert and law enforcement agencies stepped up vigil to prevent any untoward incidents. Chief Minister Akhilesh Yadav tweeted that the Central government “must set up special banking counters in villages and district centres to assist villagers, public and farmers”. There is a fear that people in rural areas many not understand the measure and ways to change the notes that they have.